Perhaps you've noticed something a little different about the forum. Please take the time to explore all the new features and get used to the new set up. There may be a few issues that come up with the change, like broken links from the old forum & pictures not showing up. Also some old html may appear here and there but some things just couldn't be fixed in the change over. We went from 1 forum software to a different one and from one platform (Windows) to another (Linux) so some things may not have converted perfectly. Please let me know of anything that's way out of the ordinary. Enjoy! Very nice. I dig the scheme a lot. It'll take some time to get used to but I really like it. Looks good, but still exploring. I noticed that in a few signature lines there are some format type codes showing up. Much cleaner . . .will take a few days to get it user friendly . . . overall - good job! WARNING:This post may contain items including, but not limited to, sarcasm, irony, and hyperbole intended to bring humor to this discussion. Those of you who are overly sensitive or who have no sense of humor are better off ignoring this post. Looks good so far. Let's see if my signature shows up. I guess not. Will have to figure that one out. Bass, the amniotic fluid of life. I stand corrected. i really like the look of this and there are obviously a lot of bells and whistles more than we're used to. Liking the change. 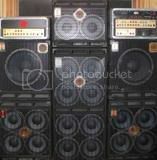 John the barbarian everytime that i see the photo of eden amps and cabs that you have i admire it !! When you post a reply, you get tossed back to the main menu instead of staying within that thread and category. Spell check was added! YAY!! Yep. This is much nicer! I agree, If it ain't broke don't fix it. It looks good but wasn't needed.And it's harder to read. Too much black and grey, but that's just me. As I said, it does look good though. Prowled through my profile options and can't find that. How do I get there?